Like South Australians, Germans are attempting to run on sunshine and breezes and in both places the results have been an unmitigated disaster. When power output depends on the weather and whether the sun is up and the sky isn’t clouded up, results can, as they say in marketing blurbs, ‘vary’. Germany’s power grid almost collapsed in January due to poor performance from wind turbines and solar panels, according to data from a major trade union. Wind and solar power plants under-performed in January, 2017, because of cloudy weather with little or no wind, setting the stage for massive blackouts. A major blackout almost occurred Jan. 24 and was only prevented when German energy suppliers “also took the last reserve power plant,” Michael Vassiliadis, head of the union which represents power plants IG Bergbauchemie Energie, told reporters. The country’s power grid was strained to the absolute limit and could have gone offline entirely, triggering a national blackout, if just one power plant had gone offline, according to Vassiliadis. “The renewables could not even offer five percent [of total power demand.] Coal, gas and nuclear power kept the country almost in the first place under the electric current,” Vassiliadis said. Germany was forced to recommission coal power plants to simply keep the lights on. 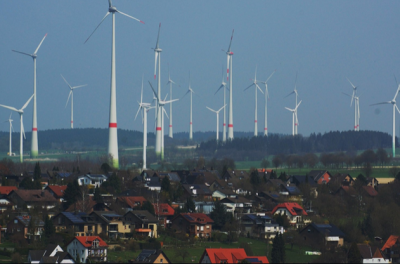 From famine to feast and back again, Germany’s renewables rush has not only threatened to plunge the Country into the Dark Ages, the chaos being caused in the power market is sending power costs through the roof. Here’s NoTricksZone.